This study investigates the effects of Government-Linked Investment Companies (GLICs) and state ownership on the Corporate Social Responsibility (CSR) disclosure using a sample of 190 Malaysian listed companies over the period 2009 to 2014. The results of Weighted Least Squares (WLS) show that GLICs and state ownership are negatively associated with CSR disclosure, thereby indicating that an increase in the level of GLICs and state-owned shares in a company leads to a reduction in the level of CSR disclosure. This study provides evidence to policymakers that the role of government is supported in promoting GLICs to integrate and implement CSR policies. Furthermore, it provides evidence to shareholders, managers and investors that GLICs and state ownership disclose less voluntary information – both voluntary non-financial and CSR information. 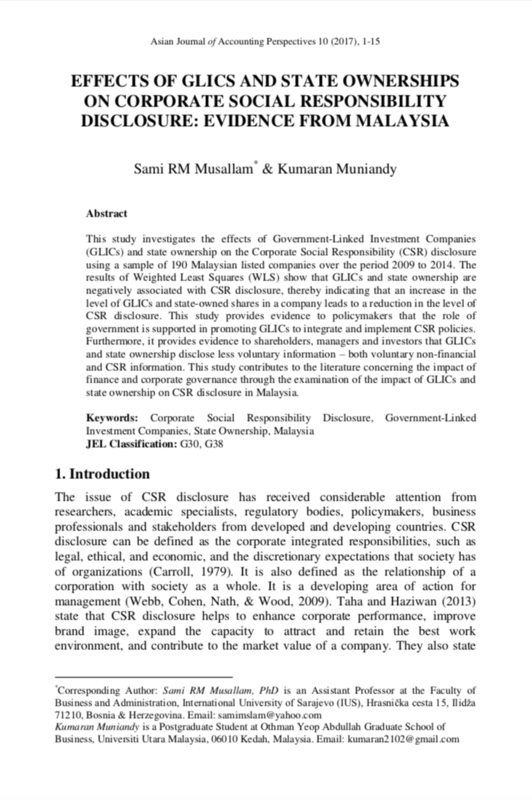 This study contributes to the literature concerning the impact of finance and corporate governance through the examination of the impact of GLICs and state ownership on CSR disclosure in Malaysia. MUSALLAM, Sami RM; MUNIANDY, Kumaran. Effects of GLICs and State Ownership on Corporate Social Responsibility: Evidence from Malaysia. Asian Journal of Accounting Perspectives, [S.l. ], v. 10, n. 1, p. 1-15, dec. 2017. ISSN 0128-0384. Available at: <https://ajap.um.edu.my/article/view/11276>. Date accessed: 20 apr. 2019.